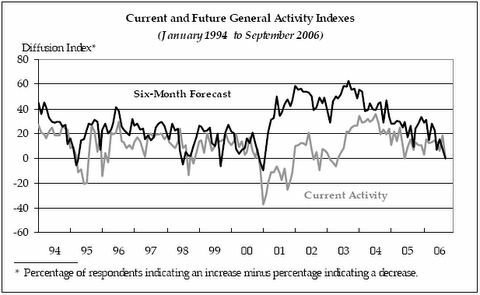 The survey’s broadest measure of manufacturing conditions, the diffusion index of current activity, dropped from 18.5 in August to -0.4 this month. 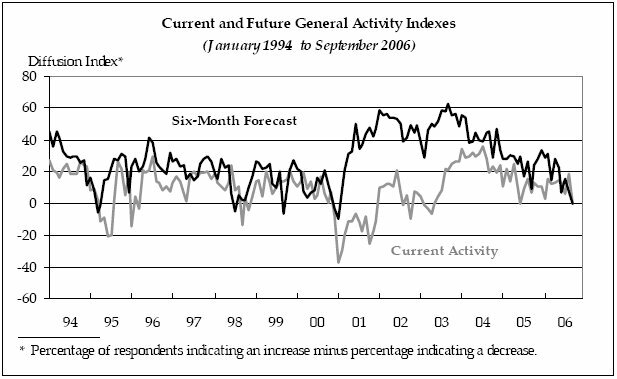 This is the first negative reading in the index since April 2003, although the index registered a zero reading in June 2005 (Chart ). Twenty-seven percent of the firms reported increased activity this month, down from 35 percent in August. The percentage of firms reporting deteriorating conditions rose from 17 percent in August to 28 percent this month. The new orders and shipments indexes both fell precipitously this month: the new orders index fell 17 points, and the shipments index fell 29 points, both recording their first negative readings since April 2003. Both the delivery times and unfilled orders indexes edged lower and into negative territory, following slightly positive readings in August. Respondents reported increased costs for inputs again this month, but increases were not as widespread as in previous surveys. The prices paid index remained at a relatively high reading of 38 but receded seven points from August. Forty-one percent of the firms reported higher input prices; only 3 percent reported lower prices. Twenty-seven percent of the firms reported higher prices for final manufactured goods, up slightly from the 25 percent that reported increases last month. The prices received index increased nearly five points this month. Do you expect the following capital expenditure categories in 2007 to be higher than, lower than, or the same as in the current year? Take a good hard look at the number circled in red above. No ask yourself how likely it will be that business spending and growth is going to take up the slack for slumping housing and consumer spending. We can now put to bed the myth that a "Goldilocks Scenario" of a soft landing in housing coupled with a business expansion will keep the economy humming. We have never had a soft landing in housing before so why should we have one now? We have never had a national housing bubble to this extent before and we surely have one now. Typically consumer spending is somewhere between 67% and 75% of the economy. In this recovery consumer spending and housing may be as high as 80-85% of the economy. It is well beyond silly to expect business spending can counteract a decline in consumer spending, housing and housing related activity. The above numbers show serious contraction in structures. This will amplify the turn down in housing. Retail store expansion is surely not going to pick up any slack either. It seems robust now only because it is following housing with a lag (new subdivisions are built and new strip malls and retail stores follow). We still have expansion for now, but that is for stores planned long ago. The overbuilding of housing and condos continues. This is going to continue to put pressure on prices. Falling housing prices will stall cash out refis and housing ATM spending. As I stated above things "seem" OK for now. Given the lag between housing expansion and retail store, strip mall, and restaurant expansion I expect that at some point (probably very soon now) we are going to see "lights out" on such retail expansion just as we saw a dead halt to condo and home sales in numerous places. As shown in the above charts, manufacturing sure is not coming to the rescue either. So where is job growth supposed to come from? I suggest nowhere. It's time to kiss Goldilocks goodbye.